works, and to help you make copyright awareness a part of your day-to-day business. There are some limited exceptions in the Copyright Act (1968) (the Act) that cover schools, universities and colleges for different uses of creative materials. However, there are many further uses of those materials that fall outside the allowances in the Act, so it is important to know when those further uses come into play. Schools, universities and many colleges can obtain blanket educational licences through societies like APRA AMCOS, ARIA and PPCA. Private and peripatetic teachers, however do not qualify under these blanket licences and therefore need to make sure they are obtaining licensing for their needs on a case-by-case basis. That is why this guide is useful. 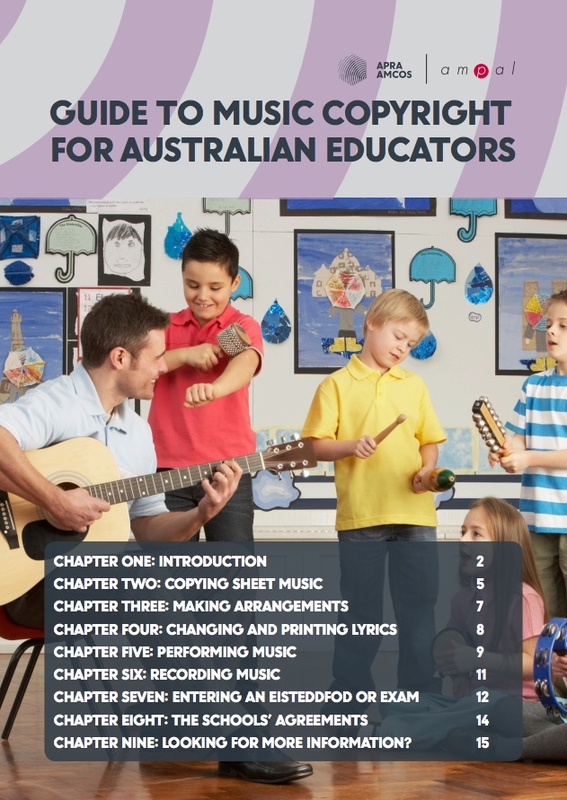 It is a one-stop shop to help music educators understand how copyright works, why it is important and where to obtain licensing.